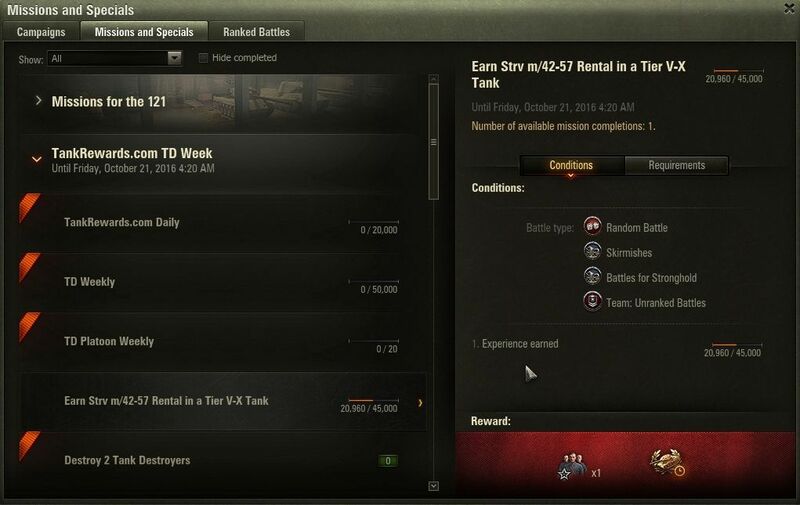 Wargaming regularly provides challenging missions to test your skills in battle rewarding you with XP, consumables, Personal Reserves and more! But are you not entirely sure how these missions work or where to find them in game? Well, here's a quick guide to get you on your way to earning rewards with our in-game mission system! Missions are unique challenges that test your abilities in battle. Each mission has three components: conditions, requirements and rewards. Conditions are what you need to do to complete the mission. Requirements must be met before you can attempt the condition. Rewards are what you receive upon successful completion of the condition. Play a battle, destroy at least two (2) enemy vehicles and place in your team's top 10 XP earners. Where Can I Find Missions? 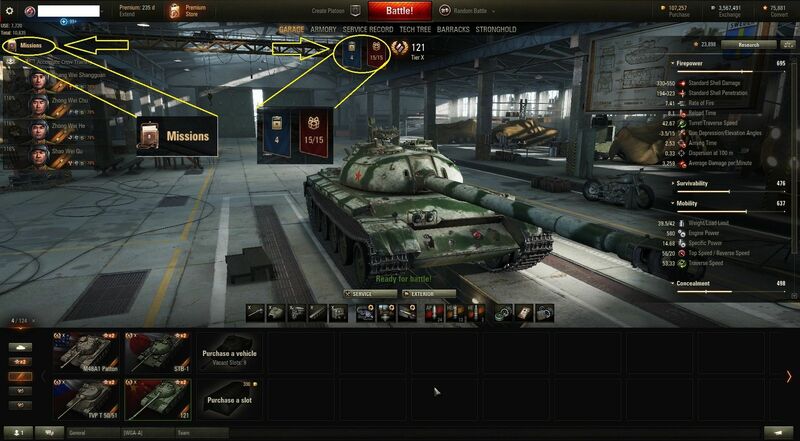 Once you've logged into World of Tanks, you'll find yourself in the Garage. On the left side of the screen, just above your Crew members, you'll see a button labelled "Missions". Once you've clicked that button, the Missions window will open. In that window, you'll start on the "Campaigns" tab, which displays different sets of personal missions. The "Missions and Specials" tab displays limited-time missions, bonuses and discounts. 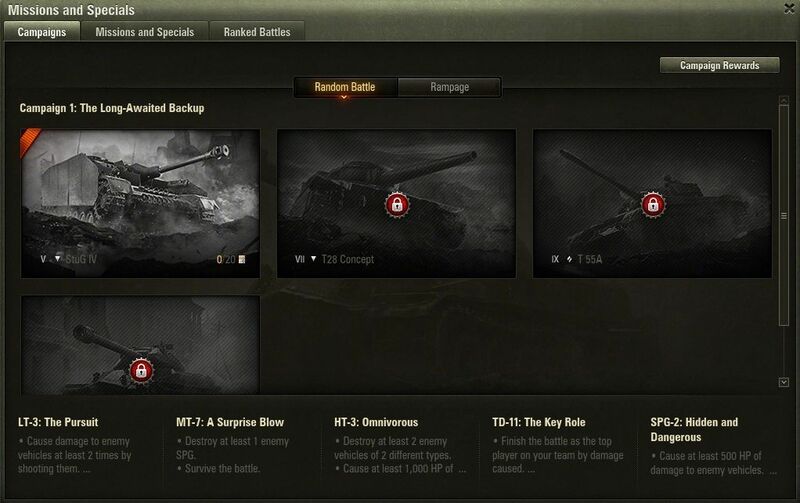 The "Ranked Battles" tab lists the missions available only in the competitive Ranked battle mode. Click on a campaign to open its set of missions. Personal missions don't have an end date and must be activated to complete them and earn their rewards. Click "Start" to activate. 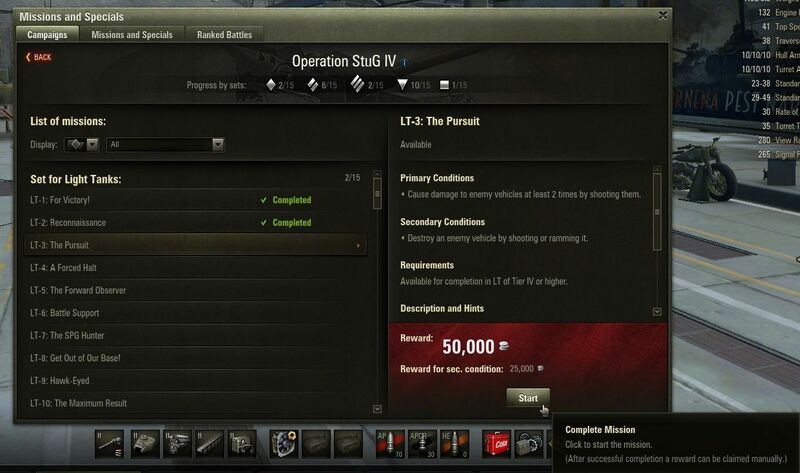 The second tab in the Missions window labelled "Missions and Specials" displays discounts, bonuses and missions that are only available for a limited time. Click on a mission to see its conditions and don't forget to check that you meet the specific requirements. As long as they are met, these limited-time missions are automatically activated.